Json provides a new look into his life with his sixth album. Pulling the name, No Filter, from the hashtag commonly used on social media, he wants to provide clips from moments in his life without the filter. This album has a stunning 12 featured artists, which can be a positive or negative, but Json uses them to create a good mix of sounds throughout the album. The big theme of the album comes from identity, and being who God made us to be. The hook of “Preacha Man” (feat. Monty G) caught my attention right away and makes it a unique track. The Jamaican sound Monty G adds is an interesting twist that works well, “I used to wanna be dope dealer, now the hood calling me Preacha Man”. That part I just can’t get out of my head. Json spits a few sweet verses about how he used to deal drugs. His gritty style in this song meshes extremely well with Monty G to create a great track. “Light Up” (feat. Serge) has a slower style from Json. This time Serge delivers the great hook that flows perfectly into Json’s verses. The sweet beat with just the right amount of bass and switch up during the refrain works so well. This is one of the tracks that cover the issue of identity. My favorite quote comes from Json’s first verse, “Every ad I see, in the magazines, on the TV screens, tell me who to be. Lord am I still there, somewhere beneath”. The meaning and amazing sound definitely make this one of the best tracks on the album. Another deep track is “Identity” (feat. Jai). We all have imperfections and things we think are wrong with us, but God made us in his image. He loves us for who we are and who he made us to be. If you haven’t seen the music video for this one I definitely recommend it as it adds to the meaning visually. The beats fit well with the mellower tone of the song, and Json and Jai work well to express the struggle of identity that is ever present in modern society. Json relives old memories in “Remember” (feat. J.R.). The piano makes this song in my opinion. It’s not something which is often used in hip-hop, but it adds to the genuineness of the memory in a way. Json doesn’t have his best rapping in this track, but he and J.R. do produce a beautiful storytelling song overall. I can almost picture the moments he’s describing, and that makes this a special song. “Stunna” (feat. Tony) has another great hook between Tony and Json. The track has a cool beat that works well with the hook. This makes it a really good track, but Json’s verses add something that makes this a great one. A track with another sweet flow is “Love to Do It” (feat. Keno Camp & J Carter). There’s no huge push of meaning in this track, but the cool sound works extremely well. The hook is extremely catchy and really does make the song. The bass and beat seem to be missing something as well, but it is still an awesome track. “Filter Effect” (feat. Charde Jones) is another great track on the topic of identity. Json speaks about multiple people feeling rejected by the world. The world’s expectations beat them down. Each verse begins with, “Blessed, but…” as everyone has been blessed with life, but all they see is their current struggle in the world. The chorus is from God’s point of view saying, “I do see the scars that have broke your heart. These broken pieces aren’t who you are. My love is deep, and I’ll show you now. Just look at my Son, believe me”. This is a beautiful track on the album that combines awesome rapping, a great hook, and a deep meaning. No Filter approaches the problem of identity extremely well throughout the album with great sound on top of the meaning. The featured artists create some absolutely terrific hooks along with Json’s legit rapping. There’s some amazing and unique tracks on this album, but it’s a large album and tracks such as “Like That” and “Winter’s Bone” are missing that special something while “My G” has a beat that can get annoying at times. A large album will have tracks like those though, and overall No Filter is an epic album. I recommend picking it up for sure. 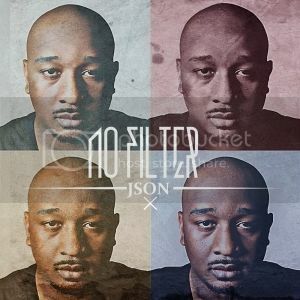 No Filter is available for sale on iTunes and other digital retailers.